Being born and raised in Nebraska, I always dreamed of the chance to represent this great university on the football field. No matter where my family and I were, we would never miss a Husker game, even if it meant listening to it on the radio at our cabin. As a specialist, naturally, my favorite Husker moment growing up had to have been Alex Henery’s field goal late against Colorado. It is something I will never forget. My brother and I were sitting in east stadium, under the balcony with my grandfather’s season tickets. After that kick, Husker fans let out the loudest roar I have ever heard. I have lived in Nebraska my whole life and grew up two hours west of Lincoln, in Kearney. I spent my childhood watching future Nebraska specialists Brett Maher and Spencer Lindsay kick for Kearney High School. Personally, I think half of the battle when learning how to kick footballs is having a mentor who knows what he is doing. I was fortunate to have two. I set my sights on following their footsteps for as long as I can remember. Soccer was actually my favorite sport throughout high school. I found a lot of success in soccer, but the opportunities for collegiate soccer were fairly limited in the Midwest, especially since I also wanted to attend a bigger university. Besides, my heart had been set on Nebraska for quite some time. And nothing was going to change that. But unfortunately, the chance of playing football for the Huskers didn’t really play out in my favor... yet. 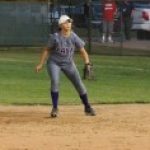 Going into my freshman year, I hung up the cleats and thought I was done with competitive athletics. Luckily, I was wrong. 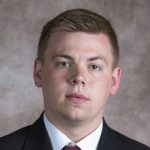 About halfway through the football season my freshman year, I received a phone call from the football office, and well, here we are. Sure, it wasn't the most conventional way to join the team, but I’m beyond thankful for that chapter in my life as well. During my first off-season, I had the chance to go through spring ball and summer conditioning with Sam Foltz. Not only did Foltz critique me, turning me into a better punter, but he also humbled me and showed me how to best represent myself off the field with this new platform that I had been given. It's difficult to express how thankful I am for the time I was able to spend with him. Over the years, I have always held one promise to myself, and that is to never give up. I would be lying if I said it had never crossed my mind, but I quickly remind myself of the reason I’m here to begin with. After all, being a Husker has always been my dream. So, while I didn't see any playing time my first few years, I kept looking at each day as an opportunity to improve. The first time I took the field was my junior year (sophomore year in football) at Purdue. Zach Darlington had come down with mononucleosis and since I was the second-string holder, I got to go out on the field. As a competitive athlete, being the holder wasn't the most glamorous achievement, but getting back on the field reminded me why I fell in love with sports in the first place. Fast forward one year, I finally got the opportunity to punt during our away game at Wisconsin. I was surprised at first, but it was a situation I had played out in my mind every game for two and a half seasons. I was definitely more excited than nervous. I always knew that once I got my shot, I would be prepared. Frankly, this is the first time I have really sat down and reflected on my career up to this point, and I think it has been good for me. Time flies and it’s easy to get caught up in the whirlwind of being a student athlete, so reflecting on these memories is really important and helpful to me. I take a lot of pride in finally getting my chance after working hard for so many years. 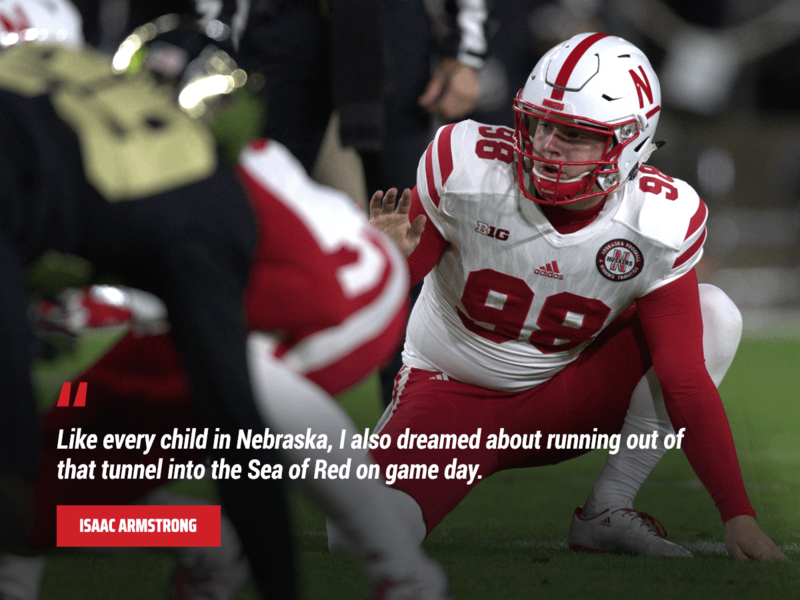 Like every child in Nebraska, I also dreamed about running out of that tunnel into the Sea of Red on game day. Being able to live this dream is just one of the reasons why this whole journey is so special to me. For this upcoming season, I will continue to improve, work on my consistency, and do everything I can to help Barrett (Pickering). I also need to thank the great state of Nebraska for their outstanding support. The fans have stuck with our program through some rough patches and times of change. I am confident in Coach Frost and his staff to continue changing the culture back to what it once was, and I can’t wait see where he takes the program. I will always be thankful for my time at Nebraska, but just to be clear... I'm not finished yet. Thank you to the Nebraska Huskers for providing us the photos.